With March flying by (must be all the beautiful weather), we wanted to enjoy a beer that literally translates to "March Beer". 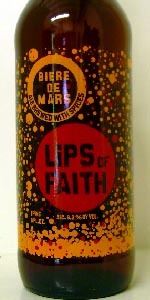 Biere de Mars is a Lips of Faith offering from the folks at New Belgium Brewing, and drinkers are rewarded with a subtle, yet creative brew. Biere de Mars pours an intriguing hazy orange, with only a small cap of white head that provides a good amount of lace throughout. A somewhat muted nose offers hints of caramel, citrus, earthiness, spice, and some funkiness. Sweet malt flavors are first to hit the pallet before blending into some more interesting and delicious flavors that include apricot, lemon, and spiciness all before a slightly tart finish. Medium bodied and a medium-light level of carbonation round out this complex and exciting brew. Always a favorite this time of year. Poured a murky brown color. Kind of like an old penny. Lots of little floatie bits in there too. Slight head that dissolved nearly completely. Surprisingly heavy carbonation. Nose reminds me of a musty flooded basement. Flavors was overall bland. At first the hops and alcohol were non-existent behind a moldy flavoring. After a bit a slight hop bitterness came out and something that is akin to alcohol heat but (honestly) I am not quite sure. The yeat is kind of pungent. I usually like yeast flavors but in this beer it is a bit of a turn-off because it is so musty. Medium body that kind of clings around the nasal cavity which helps the flavor linger. Beer is yellow and hazy with a thin white broken head that leave a little lacing on the glass. Aroma is spicy, smells a little like ginger and tea. Beer is medium bodied, has a little alcohol on the front, the rest is oddly dry and spice. Drinkability is fine, mouthfeel is OK, its a good beer. Spicy tea, in beer form. A: A clear golden color with a thick off-white head. S: A strong horse-blanket, sour aroma is all that I can smell in this beer. T: Somewhat sour and funk flavor that is a little bitter in the finish. It says ale brewed with spices on the bottle, but I'm having trouble picking up on the spice. There might be a faint fruitiness and clove flavor way in the background. M: A good mouthfeel. A spicy feel from the carbonation. D: It's an OK beer, nothing good nor bad. It's out of the ordinary which is good. It's worth a taste but only just once in my opinion. This pours a cloudy orange with little head that doesn't last at all. Plenty of sediment floating around. This is my first experience with this style but I'm sure this is normal. Not bad. The smell is kind of a bready orange, for lack of a better term. I see that they use lemon but I catch its citrus cousin instead. I don't mind a bit of orange in my beer. This smell is not as evident in the taste, it is mostly light bread but not objectionable. It feels good on the mouth, you don't feel the sediment as all. Pretty smooth really. As for drinkability, I don't want too many of these, but one or two isn't bad. Overall this isn't a bad beer and worth a try, but is not memorable enough for me to seek either. a- a very attractive orange-hue just like the bottle tells you. but with a fleeting to useless eggshell white head that only lightly laces. few bubbles. t- follows taste very well, smoothly goes through light citrus orange and lemon, and i would swear that is grains of paradise like some other wits but it doenst say it on the bottle. m- light and generous on the palate with very little carbonation. d- very, goes back easy, not a lot of alc and finishes clean and refreshing. On tap at the brewery -- talk about fresh and properly-served! Brewed with Pale, Aromatic, C-40 and Carapils malts, all fairly lightly-toasted. Willamette, Cascade and Magnum hops are very much kept in abeyance here, with only 18 IBU. The malts dominate the smell and the taste. Unpasteurized (as all of this brewery's ales are! ), unfiltered, bottle-conditioned spring ale on its first run of the season ("Beer of March" served fresh in late December? -- go figure!). Semi-cloudy, orange-colored pretty looking beer. Notes of orange and lemon in the nose, with wheat and maybe even oats. Taste matches, but lays a bit lower than the smell. Very drinkable and very pleasant. You who live in Colorado need to try this one at the brewery. You who don't live in Colorado -- well, tough luck! Come and get it!! Much more long-lasting head -- huge, rocky, solid and chunky with incredible carbonation. It's a bit creamier brew, so I would up the mouthfeel to 4.0 from last winter's run. prAna was right -- this time around, they've done better on this one! The addition of more brettanomyces yeast makes for a horsier flavor, which I enjoy, but some people loathe. Makes it a more distinctive beer, and more of a love-hate brew as well. For you hop-heads, it seems hoppier this time as well. Go get some. Beer pours a hazy orange with a fluffy white head that sticks around for the party. I like this beer in the late winter or early spring, it has a great hint of the season with some fresh orangey fruity aroma and is light on the palate. It's got a nice soft mouthfeel, that goes down easily and invites another. Drinkability is it's strong suit. This was on tap at the Chocolate Bar. Hazy gold straw colored with a thin white head. Delicate aroma of citrus orange, a little clove, and a hint of fresh bread. The taste is light and citrusy. Nice orange bitterness balanced by a hint of clove and white pepper. Just a touch of heat. Light and satisfying mouth feel. This would be a great summer beer, heck it's a great anytime beer. New Beligium's seasonal's rock. The 2 degrees below is good. This beer is great. Just got home from work and made some lentils with a spicy Spanish sausage cooked with red wine and olive oil. I decided to crack open this bottle that I got from a friend out in California to accompany my meal and act as an after meal dessert. Appearance: Pours a clear amber color with half a finger of head. The head doesn't last long at all. It's dissipating quickly as we speak. I give the beer a few swirls in my snifter. The lacing is non-existent. The beer is slightly effervescent; a few bubbles are making their way up to the top of the glass. Smell: The nose picks up a citrus note like lemon. There's an earthy aroma here too, rather herbal. The citrus and earthy notes are likely from a combination of hops and the spices used in the beer. Taste: The malt profile on this doesn't stick out. I don't pick up any sweet or toasted malts. I think it's there to support the spices and supposed brett yeast that they added. I can pick up citrus notes, those are there for sure. A blend of tropical and acidic fruit like mangoes and lemon. On the aftertaste there is a slight herbal flavor, and a very subtle brett character as well. The brett can easily go unnoticed. Mouthfeel: A medium bodied beer with a moderate amount of carbonation. There are some oils coating my tongue, teeth and gums after each sip. Drinkability: It's an incredibly drinkable beer. It goes down easy, and after 22 ounces of this I feel like I only took a few sips. I could easily drink two of these in an evening, and I'm not someone who can handle a lot of alcohol. I wasn't that impressed with this beer. It's definitely not a wild ale, as there is really no sourness or funkyness to this beer. That doesn't make this a bad beer, but it doesn't align with the expectations one has when purchasing it, and it doesn't follow suite with the style it's under. A: Pours a light cloudy orangeish color, slight white head and very minimal lacing. Lots of whitish sediment floating in the glass. S: Smells of yeast, sourdough bread, slight citrus smell. T: Slight maltiness with peppery finish, kind of musty and bland as far as the taste goes. M: Beer had a creamy mouthfeel went down very easily. D: To my knowlege this is the first beer of this style that I have ever tried. This beer was a little bland for my liking, had a nice aroma to it but overall I don't think I would try again. A-Pours a hazy orange hue with two fingers of off-white head. S-Smells of mild, tart cherries with some hint of spice that I can't seem to put my finger on with some leathery, Brett notes. T-Slightly acidic and lemony/leathery brett on the finish. M-Mildly carbonated with sticky mouthfeel and a medium body. D-A very drinkable beer, however this is a mildly flavored American Wild. A good gateway beer for those who haven't had sours, but for those that love and adore sours, this one is a little bland. There is a substantial amount of yeast on the bottom of the bottles in my six-pack and it does not pack tightly. It is almost impossible to pour without getting a substantial amount of "floaties" in your beer. A normal pour yields a very turbid beer. With a little care in your pour, you can see a clear, orange beer in your glass. The head is light and collapses fairly quickly. All I could smell in the nose was yeast and a bit of oxidation (although, to be fair, the "best by" date is only 5 days in the future). The flavor, however, is very good. A mix of grains -- the label says oats, wheat and barley -- yields an interesting, almost cracker-like flavor with a crisp edge. The lemon verbana (whatever-the-hell that is, it's listed on the label), gives a slightly tart zing to the finish. Full mouthfeel with low carbonation (by US standards). Personally, I think a little more attenuation and carbonation would have been a good thing, but that's just my opinion. I think most people's opinion of this beer will depend on their acceptance of a substantial amount of yeast floaties in their brew. I like a good, turbid wheat beer every once in awhile, but somehow the amount of yeast in this beer was just too much for me. The beer underneath the yeast was tasty, though. If I see this seasonal next year with less yeast in the bottle, I'll grab another six pack. Had this on tap at The Dray in Seattle. I was pleasantly surprised by this Belgian Golden Ale. It is well balanced, supporting a great, albeit subtle taste - very refreshing. Not as complex as I had hoped, but very drinkable. Looking forward to trying it again soon.